We spent some days of relaxation in Cusco and we were feeling ready to continue with the next part of our trip in Peru. We had decided to ignore Machu-Picchu and visit its undiscovered (at least, not that over-exploited) sibling: Choquequirao. 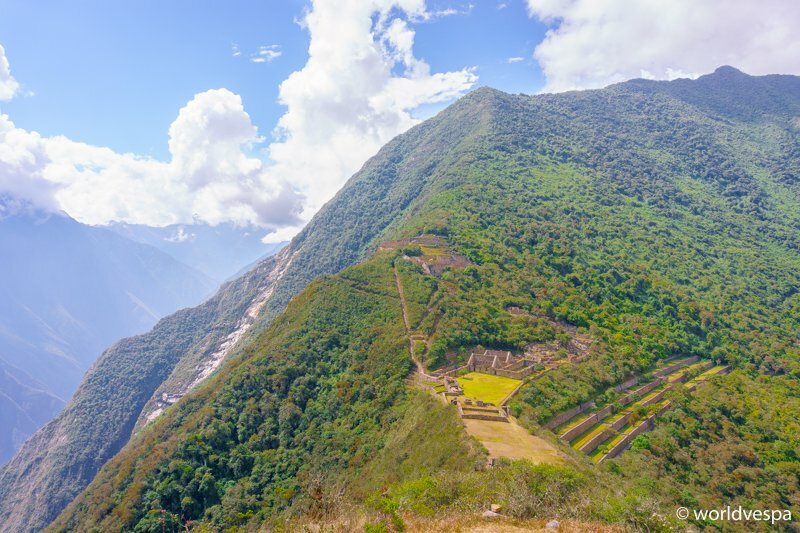 Choquequirao is another Inca city which is under archeological excavation and the last few years is getting more and more known to travelers. We had learned about it by a French couple of travelers who described the whole experience as unique. 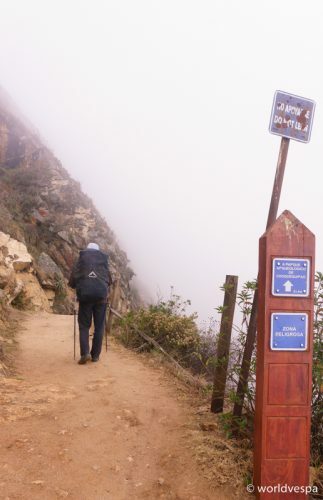 Another reason why Choquequirao is not that famous is because of the difficulty of access. We had our information on how to visit it and we decided to do the 4-day (at least) trekking towards it and back. Some visitors prefer to hire a guide and mules to carry their luggage but we couldn’t afford this kind of luxury. 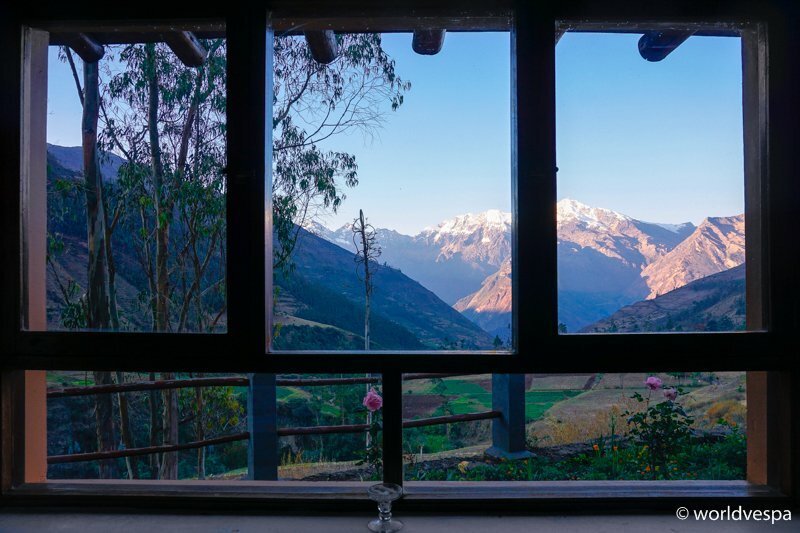 It would be the two of us on a 22km trail (and 22kms more to get back), starting from Cachora, a small village accessible by vehicles 3,000m of altitude, going down to 1,500m next to Apurimac river and then up again at 3,000m to reach the archeological site. We had our doubts about our physical condition but since we were not under time pressure, we had decided to take our time to do the trekking. We had read that there is water and food available at the small settlements / camps along the way, so we had no worries. The next day, we arrived at Cachora. The village was built at a really beautiful place, in a narrow valley between mountains, almost hidden by trees and with small streams running among the slopes. When we got there, there was a “fiesta” – a fair, taking place at the main road of the village, with music, food and alcohol and some kind of bullfighting (without killing the bull). We rent a room at the first guesthouse we ran into and after a small chat with the owner, we went out to find a place to eat. The owner of the guesthouse had started telling us about a Greek woman staying permanently in Cachora, but since almost no one knew exactly were Greece is, we didn’t pay much attention to his words. Only after a second person told us the same story about the Greek woman who stays there, did we start wandering if it’s true. A client of the restaurant we were at, called her and imagine our surprise when I heard a voice talking to me in Greek and telling me that she is coming to the restaurant to meet us! We were so happy to meet her, not only because she was Greek (sometimes, this can mean nothing at all), but because she was such a sweet person with whom we had a lot in common and we shared stories from our lives in Greece that made us feel close to each other. That day, we also met another great woman, Yovana and her husband Jan who promised to host us in their hotel when we’d get back from the trekking. Yovana borrowed us trekking sticks (which proved to be invaluable) and gave us important information for the trail to Choquequirao. We got up early the next morning, put all the things we would need for the next few days in the mountains on the vespa and left. The sun was not up yet when we left and we felt the cool breeze on our way to the place where the trail stars. At the end of the dirt road, there was a small restaurant-shop-information office etc, from where we bought some supplies and made the arrangements (a small tip) so that we could leave the vespa there for the next few days. We were now seeing in front of us the first 50 meters of the trail and… no more lies, the descent was about to begin! The days that followed were an absolutely unforgettable experience that we had never imagined! Not long after the beginning of the descent to the river and while Stergios was carrying the big backpack with most of our supplies and I had the smaller one, carrying some water and clothes, it became clear that the next days wouldn’t be very easy. The trail started from an altitude of 3,000m, went down on a steep slope to its base (1,500m altitude) and up again on an equally steep rocky slope, until it reached its end (3,000m altitude). There lied the archeological site of Choquequirao. It didn’t take more than 4kms of trekking to feel my knees hurt a bit. I started worrying about if I would make it to the end and Stergios started worrying about if he could tolerate me whining about the various aching parts of my body. 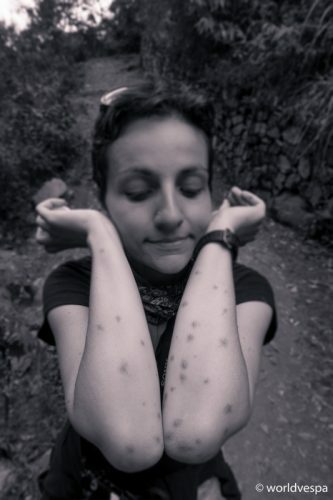 Among the nasty experiences that followed, the millions of vicious insects that stung and bit us, had a leading part and as always happens with insects, they preferred my blood…Ouch! During the trekking, our pain faded every time we stopped for a while to look around us. The view was magnificent! The vegetation of the region was so dense and all the mountains and hills were covered by a green carpet. At the bottom of the gorge, we could see the Apurimac river and we could hear the noise of the water. We didn’t meet many people on the way to Choquequirao, only 2-3 groups of 6 persons maximum walking with their local guides and having their luggage on the mules. And, while all visitors seemed tired – even exhausted, the locals who were also going up or down the gorge, had no signs of tiredness. They were not athletes and some of them were old enough, but they had perfectly adjusted to the harsh environment and the difficult conditions. We spent the first night at the camp just before the bottom of the gorge and the plan was to make it to Choquequirao 2 days after that. The truth is that we did it, but with some amounts of tears, sweat and insect repellent. 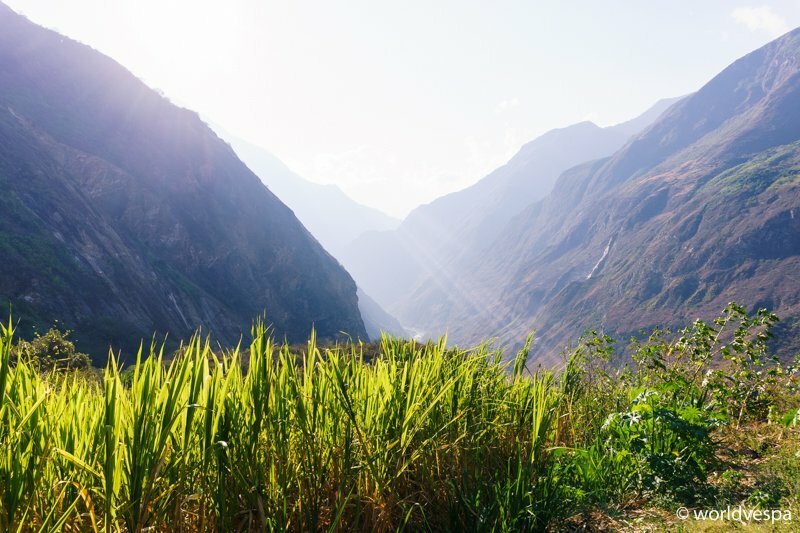 While we were walking the last 4 kilometers of the trail to Choquequirao – having left most of our luggage at the last camp before the archeological site, it was like we had wings on our shoulders! We were so impatient! We wanted to see if it worth the 3-day trekking, the insect bites, the exhaustion and if the stories we had heard were true or exaggerated. The vegetation was even more dense, the forest had something of a tropical jungle with all the humidity and the plants with the huge leaves and for the first time after 3 days, we could spot some ruins hanging from the steep slopes! The feeling we got when we finally reached the main archeological site is difficult to describe. The “butterflies in the stomach” caused only by the magnificence of the construction and the amazing environment, was something I felt for the first time in my life. And…we were alone! We could stroll around the buildings, cross the gates and lie down on the thick green grass with no one around us. We were told that no more than 80 people visit Choquequirao per day, and this happens only during the high season. So, the answer to the question: “Is Choquequirao worth the pain?” for us is: “Undoubtedly yes!”. On our way back to the village Cachora, we didn’t have any more surprises. Our feet hurt, the insect bites were itchy as hell and we knew exactly what to expect for the remaining 22kms of trekking. We even knew the menu of the dinner at the camps where we spent the 3 nights we needed to get back – rice and eggs. For the last 3-4 kilometers before we reached the place where we had parked the vespa, we were walking like experienced hikers. If someone saw us at that moment, he would probably believe that the trekking to Choquequirao is a piece of cake. 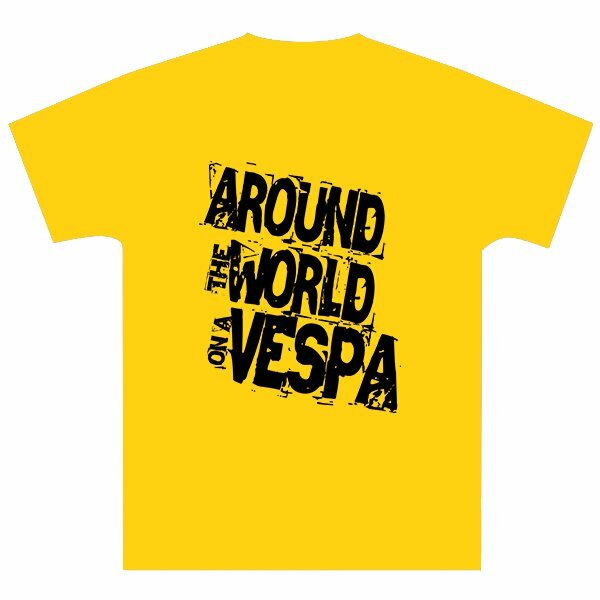 However, the truth behind our fast walking was that we were anxious to find the vespa and go back to Cachora to have some rest, as quickly as possible. We were exhausted! The plan was 100% successful and after a while, we were happily riding towards our friends and the hotel room that was waiting for us. We stayed in Cachora for 2 more days, hosted by Yovana and Jan at their beautiful hotel. We also spent time talking with our Greek friend and when the time arrived for us to continue, we felt like we were leaving some real friends behind us. It’s a pleasant surprise to realize that true friendships can be made in only some days. Well, the small wounds on our feet were healed, we had regained our energy and the insect bites were not that itchy anymore…It was time to go! We took the only way up from the valley to the main road and for once more, we promised ourselves to go back to Cachora some day. 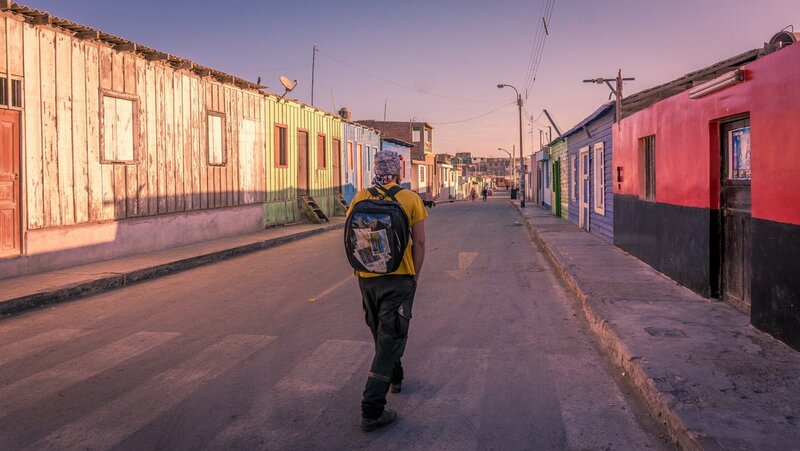 The plan now was to head southwest to the town of Nazca. 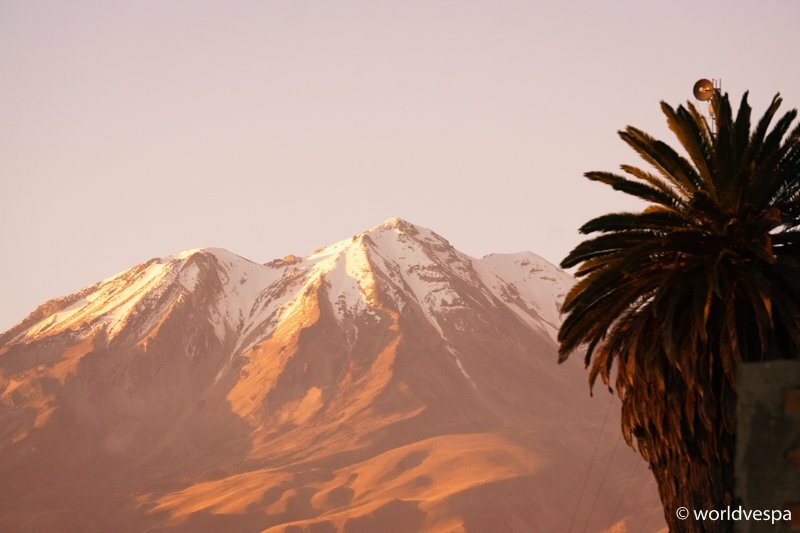 From there, south, along the Pacific Ocean and our last destination in Peru would be Arequipa, the famous city in the southern mainland. Our decision not to go further to the north, towards Lima was taken due to the only deadline we faced during our journey: the expiration date of Stergios’ passport. 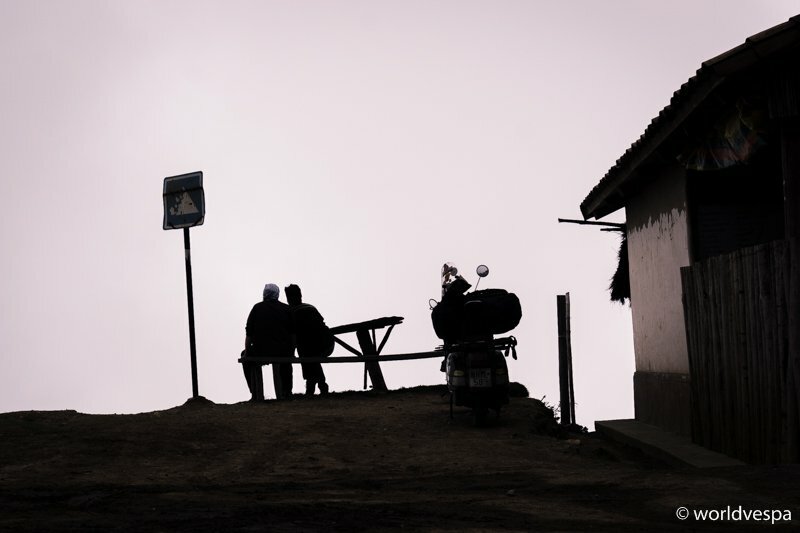 We could choose to go to the Greek embassy in Lima, but if we waited there for the passport to come from Greece, the rain season would find us in the most inappropriate roads for the vespa. So, south to Chile! We would soon see the Pacific Ocean for the first time! After an “obligatory” extended stay at a small village, due to a slight case of food poisoning, we were ready for the homestretch. From now on – with an exception for our visit to Arequipa, we would follow the “Panamerican Highway” all the way down, to Chile. We had been told that Arequipa worth the visit as it is a beautiful city and capital of the culinary culture of South Peru. 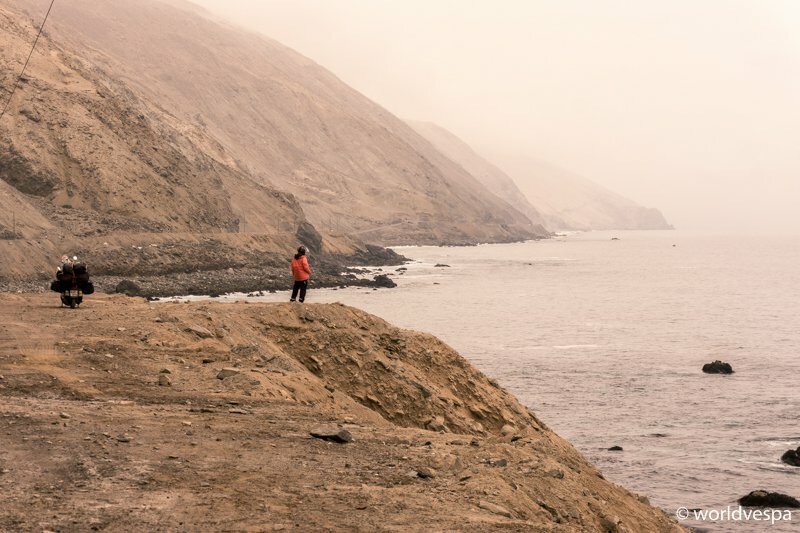 From the day we saw the Pacific Ocean, until the moment we almost reached the outskirts of Santiago, we were accompanied by strong winds and sand. 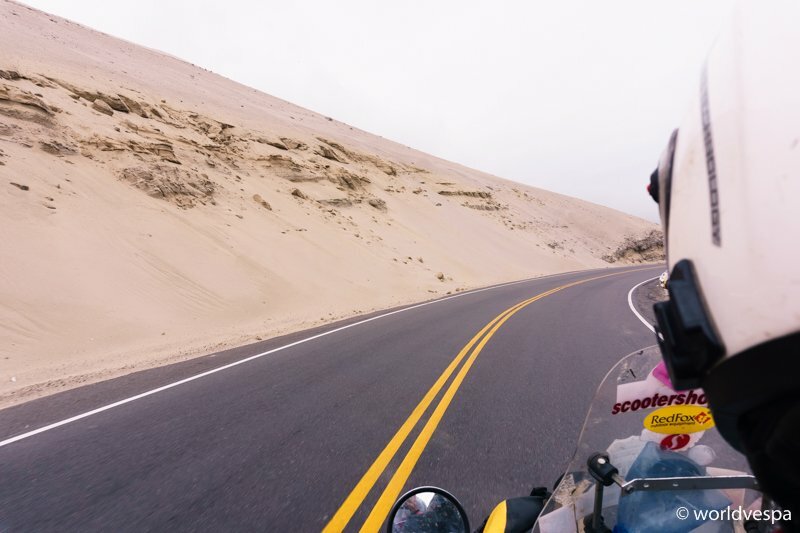 We knew that we would soon be entering the huge region of Atacama Desert, but we hadn’t realized that it starts already from the southern part of Peru. We spent our first night next to the Ocean, at a fishing village called “Puerto Lomas”. It seemed like a tourist resort but we probably got there during the low season, so things were a bit…dead. No visitors, no open stores, nothing. The small wooden and colorful beach houses were closed and even the locals seemed well hidden. We only managed to meet a kind old lady who cooked us a delicious meal and treated us like if we were her children. 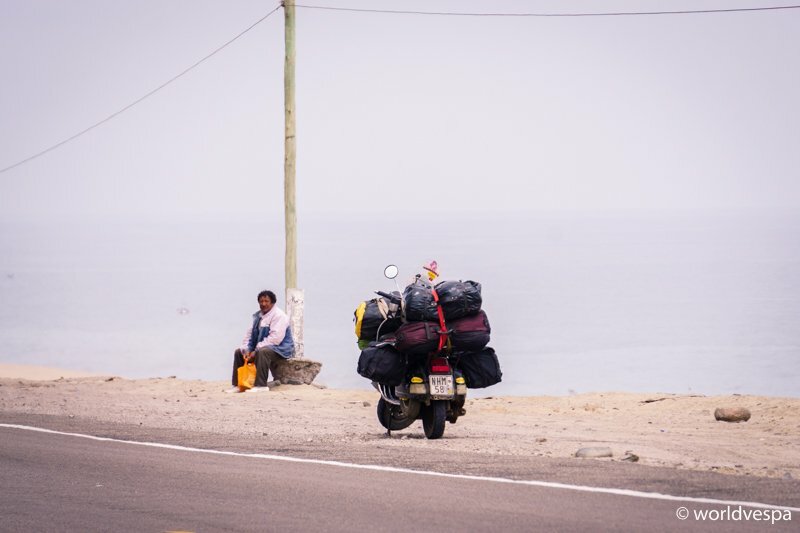 The next morning, we left Puerto Lomas to go to the Peruvian mainland for one last time. Arequipa was at only 2,300m of Altitude and we were curious to see the “White city” – as it is called. The city is built in a plateau, among 3 volcanoes (the most famous is called “Misti”) and its older buildings are constructed from white volcano stone. The whole region around, is an earthquake zone and we realized it already from day one! 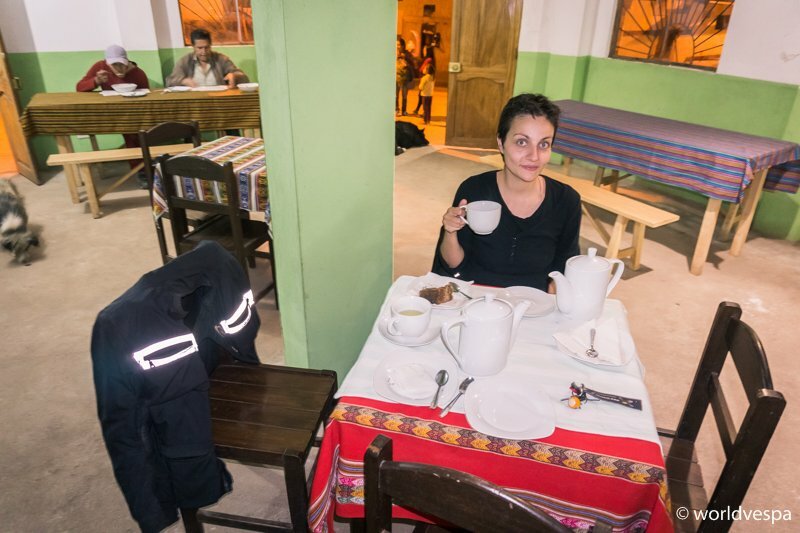 While we were having a cup of coffee at a cafeteria on the central square of Arequipa, we suddenly felt the typical noisy shaking of an earthquake! We immediately thought of getting out of the place but we saw that no one moved. We got a bit puzzled by the non-reaction of the rest of the people and we asked the waitress about the earthquake. She explained us laughing, that this wasn’t an earthquake, but only a tremble! Well, probably, when the people of the region talk about earthquakes, they mean something that we in Greece, would call an “Armageddon”! We spent about a week in Arequipa and it was the only place where a lady warned us about the muggers at the municipal marketplace. We preferred to listen to her advice and avoided going there with our cameras and handbags. 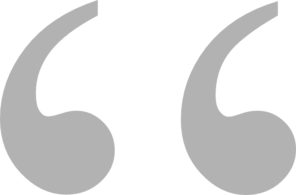 It was the first time that we didn’t ignore this kind of advice, maybe because another man we met some days ago, warned us not to stay in that specific part of the city (where we stayed without the slightest problem!). In Arequipa, we didn’t do anything different from the other cities we stayed. Some hundreds of photos, some strolling on its streets and of course, some local cuisine testing! Apart from the various – unknown to Europeans – dishes we tasted, we felt obliged to try the famous “Ceviche” (raw fish with chili peppers and lime). We didn’t regret it. We also tried the “Rocoto Relleno” (stuffed hot pepper served with potatoes and béchamel sauce) and the “Causa de Pollo” (a pie made from mushed potatoes with chicken and mayonnaise) and many other dishes, but since we don’t have a food blog, I won’t refer to our culinary experiences with more detail than this! After a week in Arequipa, we couldn’t keep postponing our departure. It was time to leave. Our next destination would be Tacna, the last town on the south part of Peru, next to its border with Chile (Arica). We hadn’t read much about Tacna. The only information we had was not deeper than it sounded: Tacna is the last town of Peru before the border with Chile. We only stayed 3 days there, trying (and succeeding) to spend the few Peruvian money we had (it didn’t worth the pain to change such a small amount). 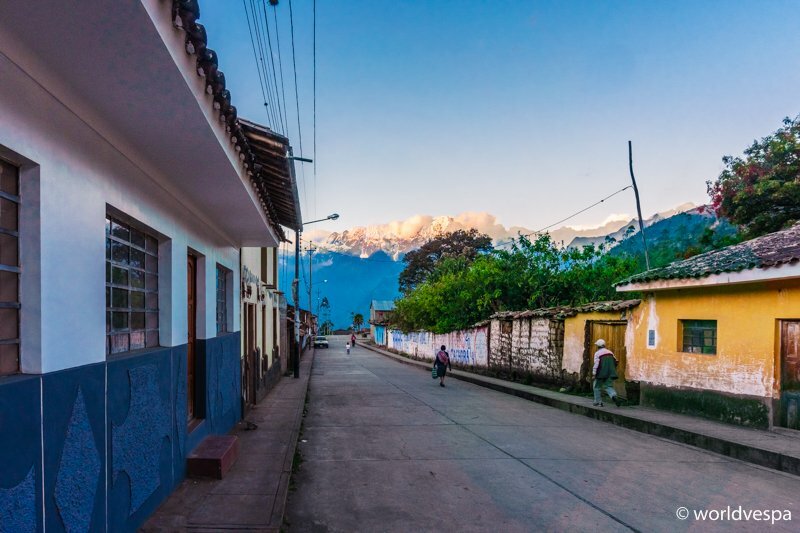 Three peaceful days thinking about our time in Peru…From our first days in this beautiful country with the kind and smiling people to the last ones, we never came across with any of the criminals, muggers and other scums we had been warned about. Maybe this reality exists somewhere and bad things have happened, but we have not even one bad memory from our stay there. Bad things can happen everywhere, but good things also happen! We will always remember the silly faces of the llamas and the alpacas, the magnificent places we visited and the legacy of the Inca Empire. However, above all, we will remember the people we met: the family in the small village of Santa Rosa who gave us the oranges, Yovana and Jan and their great hospitality in Cachora, the beautiful eyes of our Greek friend and our last meeting with our dear Galia…How can we forget all these people who made our stay in Peru unique!